Traveling has gotten a lot easier thanks to smart phones. Whether you’re stuck in an unfamiliar place or there’s a serious language barrier taking place, your iPhone or Android can be your savior. These are the best apps to download before any trip, and can help you in the many possible situations you might find yourself in while abroad. Thanks, technology! This app takes the top spot on this list because it should be your go-to app when it comes to planning your trip. It organizes your trip for you after sending them your confirmation emails, and gives your trip details, as well as a full itinerary. Since all your confirmations are on the app, you don’t have to carry around all the hard copies. Google Maps has saved me on many occasions, and has always proven to be reliable. The directions are easy to follow whether you’re driving or walking, and they can also help map out any public transportation. This currency converter is great if you’re a visual learner. Not only does it give you the currency conversation you need, but visually shows you what the currency looks like, from the smallest denomination to the largest, so you can ensure that you’re not getting swindled. Coming from the girl who got so confused when she had to use coin money instead of relying on bills all the time that she took ten minutes to pay for a drink, it definitely would’ve been an app I wish I had abroad. iTranslate can translate 80 different languages, and can be used with either a verbal or written function. The app also helps out by guessing what you’re typing, making it the perfect app to remedy any of language barrier hiccup. 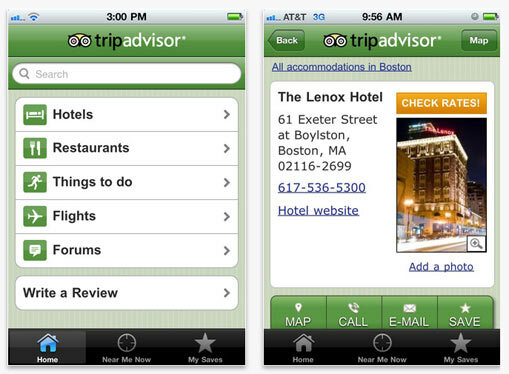 TripAdvisor is a go to site to find reviews for any new spots you might want to visit while on your trip, like new restaurants or night clubs. The app makes it easy to look up any reviews, and the Near Me Now is a helpful function to see what there is to do nearby. What apps do you download before going on a trip? Rebecca is (secretly Linda Belcher) a senior at Iona College, studying Mass Communications. She loves to travel, coffee, and her dog. Fan of boy bands, big hair, and everything bagels. Professional shade thrower and wearer of beanies.